By the time we have visited the Old Istana & Batu Caves, half day already gone. No traffic jam. Arrived at Gohtong Jaya around lunch time. Better stop to have lunch here before going further. Most restaurants were full ....we simply hentam one that have empty table for us la. Papa's friends are simple people who loves rice and loads of Cili. We ordered fried rice portion for 5 people. There were 8 of us. 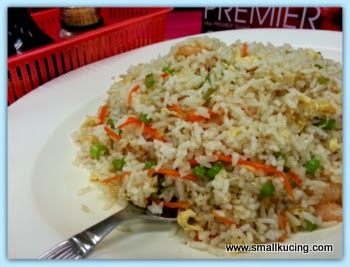 Nice leh....wah....not enough...ordered one more fried rice portion for 5 people. Claypot Taufu...hmmm...not sure why not in claypot but taste good enough. 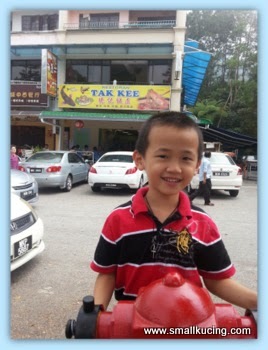 Here is the address of the restaurant : Restoran Tak Kee, No. 52, Jalan Jati 1, Gohtong Jaya, 69000 Genting Highlands, Bentong. Seems like durian season is ongoing. 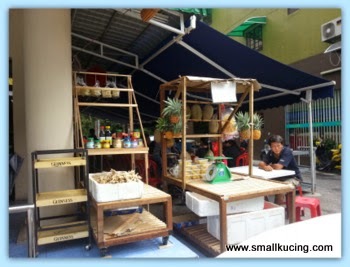 Nearly the whole road side have people selling durian, sweet corns and sweet potatoes. We did not stop to get any ......everyone anxious for the next stop. Not sure I have been here or not but I remember once when I was at a restaurant in gohtong Jaya, it was so crowded ! The rice and claypot look very good!!! I wish we could have a meal of them together and have a chat!!! I'm still not sure about durian, but I do love all the other wonderful dishes you showed us. Malaysia is on our list of places to visit some day. Amboi merayap until Gohtong Jaya there yer.. Best nyer.. For me I cannot go out toolong, can only choose a place or somewhere near.. Need to think of the kids naptime, bring their porridge meals out, if they miss their naptime they'll be cranky.. Anyway oohh yummzzz nothing can go wrong with fried rice.. Enuff wok hei.. Again I love those eggy gravy tofu... Got kids must have those eggy gravy tofu, sedapppp..
Food like this really fills up empty stomachs. I like the leafy vege. This type of food suits Small kucing as well? Next stop genting highlands? Fried rice looks very good!!! Yaloh. Why the taufu not in claypot. haha, sometimes the plain looking dish could be the most delicious huh?? of course portion for 5 not enough for 8 people la, add another plate then 10 portions for 8 ppl to share more justifiable la..
Ahh sometimes simple fried rice with cili padi is also very appetising. I think the fried rice looks delicious. It looks as if you found a good place to have lunch. Nice food especially the fried rice. I always love the restaurant fried rice because got wok hei. So fragrant, one plate not enough. 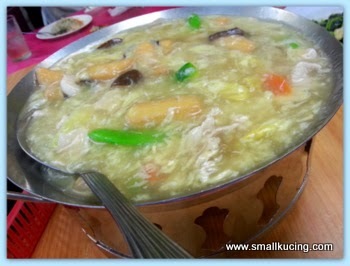 Claypot taufu looks good, see the gravy so full! Must be good to eat with rice! I have good memories eating at Gotong Jaya always! 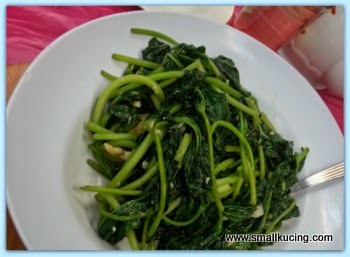 The weather was always cool and fresh with delcious crispy greens served in the restaurants. They came fresh from the nearby farms too. Nice tempting dishes. The fried with chillies? Ahhh!! triple love it. We can't get good fried rice here so I have to make it myself. I don't do such a great job but it tastes better than any of the restaurants make it here.